Dr. Steven R. Spurgeon is a staff member in the Irradiated Materials group of the Energy and Environment Directorate. He joined PNNL in 2015 and became a staff member in 2017. His research is focused on the structure, properties, and behavior of nanoscale materials systems for energy, data storage, and next-generation electronics. 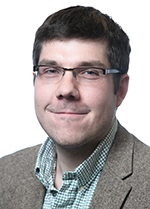 Dr. Spurgeon is an expert in the characterization of functional materials using scanning transmission electron microscopy, electron energy loss spectroscopy, and image simulations. His research employs complementary, multidimensional analysis techniques and theory calculations to generate deep insight into the behavior of complex materials systems. Jiang W., S.R. Spurgeon, J. Liu, D.J. Edwards, D.K. Schreiber, C.H. Henager, and R.J. Kurtz, et al. 2016. "CHARACTERIZATION OF PRECIPITATES IN CUBIC SILICON CARBIDE IMPLANTED WITH 25Mg+ IONS." In In Fusion Materials Semianual Report for the Period Ending 06/30/2016, edited by Daniel Clark. 72-77. DOE/ER-0313/60. Oak Ridge, Tennessee:Oak Ridge National Laboratory. PNNL-SA-120391.